300Mbps Wireless 802.11n USB Adapter with High Gain Antenna upgrades the WiFi interface on your computer to the latest 802.11n standard. Your computer can communicate wirelessly with any 802.11g/n wireless router at home, coffee shops, etc. ✔HIGH GAIN ANTENNA- You shouldn't have to put up with slow internet speeds at home, even if you're outside. Thanks to this USB WiFi Adapter, you won't have to! With 100 yards of strong extended universal coverage, feel FREE to work from your bedroom, porch, or garage. ✔FASTER DATA RATES- You may be fed up with your old cable modem or router signal, or have a broken internet card or antenna, but you don't need to replace it! 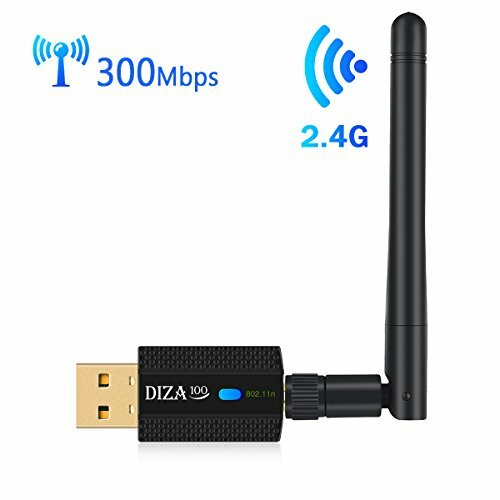 At up to 2.4Ghz 300Mbps (802.11n), this Wifi Adapter is guaranteed to get you FASTER speeds for gaming and streaming HD video. ✔EASY TO INSTALL- We believe simple solutions should be just that SIMPLE. That's why our professional instructions are 1) Plug it in 2) Install drivers and 3)GO. That's true whether you're using Windows 10, 8.1, 8, 7, Vista, XP. We've got you covered whatever device you're using. ✔SECURE WIRLESS NETWORK- The wireless adapter is supported by all WLAN routers: WPA/WPA2/WEP. And it's undisturbed by other normally interfering devices (like Bluetooth or cordless phones). Which means you won't have unexpected dropped calls or loss of wi fi signal quality. ✔A LIFETIME WARRANTY- When you invest in new tech, you want it to work for a LONG time,not just a couple of days. That's why we're constantly updating our drivers for you. Because we stand behind wifi dongle we make. If you have any questions about this product by DIZA100, contact us by completing and submitting the form below. If you are looking for a specif part number, please include it with your message.